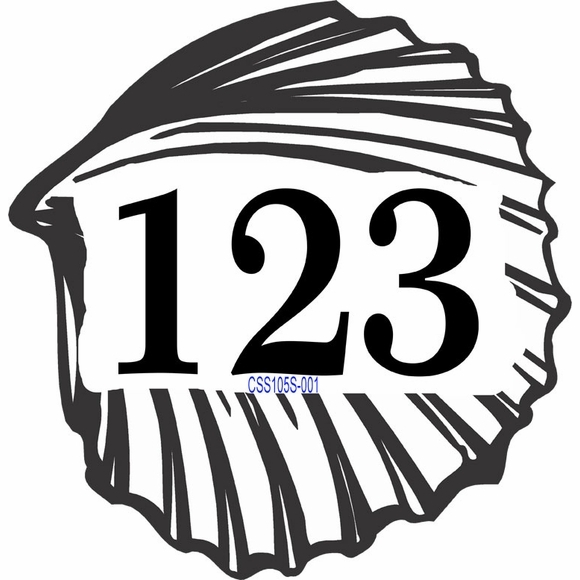 Personalized Sea Shell Shape Address Sign - - custom made with your house number and color selection. Holds three (3) 3.5" numbers. Made in USA. 10.5"W x 10.875"H (due to the irregular seashell shape, dimensions are approximate). Perfect for beach homes and other beach town properties. Made from sturdy and UV-stabilized laminated acrylic with engraved personalization and seashell details. Note: the style number you see on the sample sign is for internal use only and is not included on your custom sign. Dimensions: 10.5"W x 10.875"H x 1/8". Do you live in a beach town? Do you have a beach home or waterfront home? Accent your house with a beach theme address sign in the shape of a seashell. Made in USA.